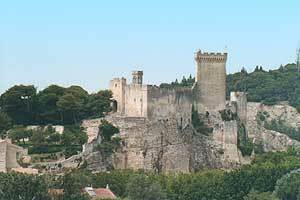 This fortress, which is one of largest of France, was rebuilt under Saint-Louis after the annexation in 1229 of Languedoc to the Royal field. It supervised the Rhone, then border with Provence, and was destroyed on the order of Richelieu. By the strengthened door, one sees the triangular tower, at side the vault and the round tower are. At the interior of the garden the museum Auguste Jacquet is installed. The castle is open every afternoon of March 22 to November 5 except Wednesday (open public holidays and school holidays).